Uniquely named Septendecim which we reckon is made up latin, but intended to mean 17. Answers on a postcard please! This is from Benriach's peated series which ,joking aside, we actually really like. This packs a real punch with the peat smoke very much to the fore but it also has a more robust and full bodied charactrer than the age and barrel selection would indicate. Any Additional Information of Note Un-chilfiltered and made from peated (smoky) malt. 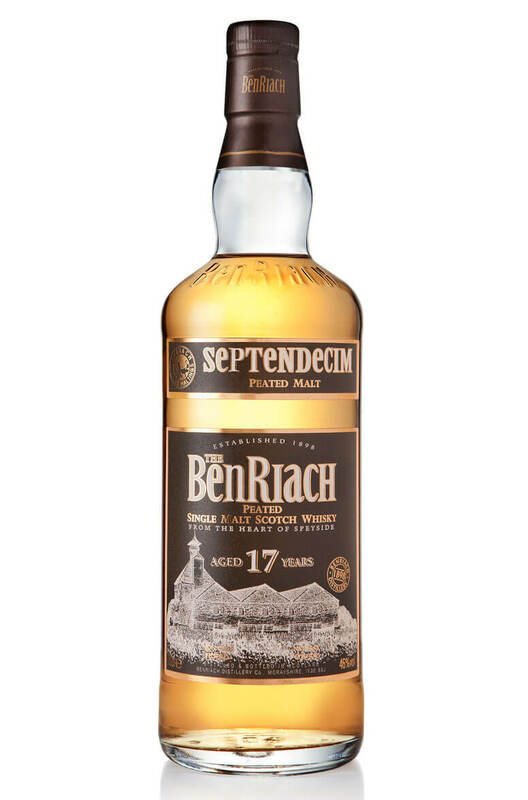 This comes from Benriach's 11th batch of single cask whiskies and has been drawn from a single T..
A peated expression of Benriach that has been finished in a Madeira wine cask. This comes from the 1..
A richly flavoured Benriach that has been finished in a Pedro Ximemex Sherry puncheon. This was d..
A great single cask expression of Benriach that has been finished in a single Marsala wine cask from..
A rare triple distilled version of Benriach that has been finished in a single Pedro Ximenez swee..
A smoky tasting, peated version of Benriach that has been finished in a single virgin (new) oak hogs.. This is a limited edition peated (smoky) expression of Benriach that has been finished in the finest..
A rich and flavour packed expression of Benriach that has been finished in Pedro Ximenez sweet sherr..
An interesting bottling from Benriach. This combines some lovely fresh flavours of pears in cream an..